Seattle Seahawks: Super Bowl Champions! We here in Seattle are ecstatic about the Seahawks crushing of the Denver Broncos in Super Bowl XLVIII. In case you missed it we won 43–8. To get ready for the event there were parties all over Seattle. 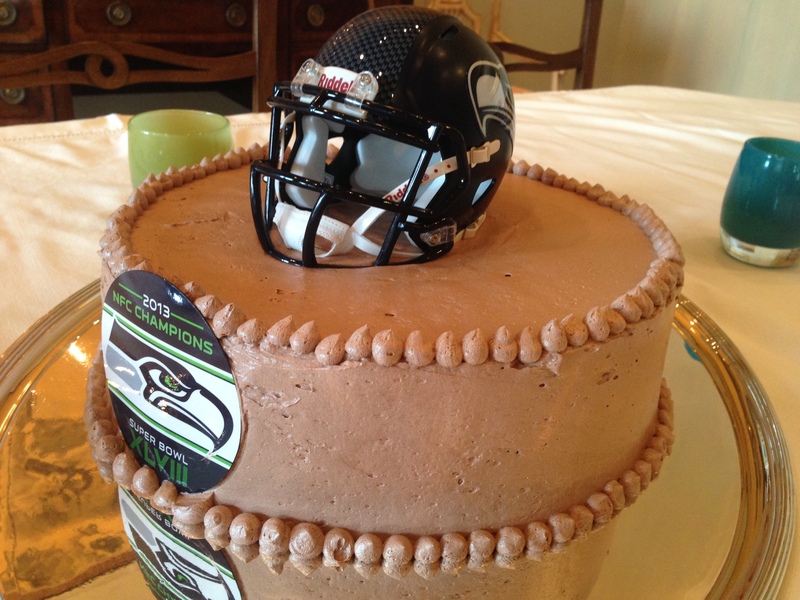 The photograph above is of a cake I made for a Super Bowl party that was also a birthday party. Today (Wednesday, February 5) is the parade, and I will be there—along with a few hundred thousand of my friends. I have been waiting for this moment for most of my life. Very happy to be one of the 12 and the legion of boom, and finally victorious in the Superbowl. We attended a party at which we were the only Seattle fans, so were demure. But when we got home we watched the game again, with abandon and thoroughly enjoyed it already knowing the outcome! My own Seahawks glassybabies are on their way to me! And oh by the way, I love your blog.